Jinjiang Inn (Shenyang South Lake Park) is located on No. 135 Nanwu Road, Heping District, Shenyang near the Fangxing Square and is as yet the largest Jinjiang Inn Hotel in Shenyang. The hotel has 240 guestrooms, each of which is provided with free WIFI and wired internet access and two meeting rooms, one small and one large. The independent restaurant is on 4F and the free parking lot is in the back yard. The hotel enjoys exceptional location in the close vicinity of the Northeastern University, Fangxing Square, Nanhu Park, Shengjing Hospital, Sanhao Street, Shenyang Conservatory of Music, CPC Liaoning Provincial Committee, US Consulate, Luyuan Antique Town, Islamic Middle School, etc. Supporting life facilities are available near the hotel, such as the RT-Mart and Carrefour supermarket, which are only three bus stops away. 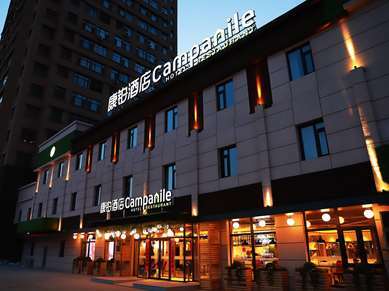 The hotel is only 2.5km from the well-known business pedestrian street in Shenyang, the Taiyuanjie Street and Zhongjie Street (in the intersection of the two streets). There are also bus lines in front of the hotel and it only takes 8 minutes by taxi to get to the two pedestrian streets. The hotel is also 12 minutes drive by taxi from Shenyang Railway Station. Guests could also take the ring line bus and Line 152 to Shenyang North Railway Station (about 20 minutes by taxi). A number of bus stations are near the hotel such as the Ring Line, line 134, 135, 152, 239, 251, 257 and 297. Each guestroom is provided with comfortable bed mattress and closed-fit and heat-retaining somerelle quilts and pillows in protection of their necks and helps them to sleep the night through. The whole bathrooms could help guests relieve the fatigue in the daytime. Engineers of the hotel also pay much attention to the safety of the hotel. Every part of the hotel's buildings has passed strict strength test. Powerful infrared anti-theft system and all-dimensional control system have been established to make the accommodation more secure and safer. Besides, all the decoration and furniture of the hotel have passed the rigorous environmental-protection detection. The hotel also minds on the breakfast the next day. Carefully prepared by the chef and nutritionist of Jinjiang Inn, guests could get needed nutrients from over 20 varieties of breakfast for health. We sincerely welcome your visit.